This time last week, I was lounging in NYC's Bryant Park enjoying a glass of Reisling at the Le Bryant Park Cafe (476 5th Ave). I strongly suggest dining al fresco there, especially in the evening. Not only is it remarkably inexpensive for Manhattan, but the vibe is relaxed and simple. We had the British to our right, the French behind us, and the Germans on the other side. Seems each group was being entertained by a local, which made me think that if the locals were dining their visitors here, the restaurant must be decent. The menu is light, mostly appetizers, summer salads, and delicious sandwiches. Loud music, screaming kids, and expensive fare wasn't to be found here, instead we were greeted by a friendly hostess, our waiter was superb, sandwiches under $10, and with the summer breeze dancing through the trees, we enjoyed our patio oasis for under $60. We lingered for hours, discussing everything from politics to religion and back again, chatted about our dreams, and held hands remembering each of the joys we've experienced since taking our vows 5 years ago. No one pressured us to leave. For once, New York felt very small and somewhat charming even, nestled beneath the canopy of green, it was hard to remember that just a few blocks south, you'd be blinded by the light show that is Times Square. Ah New York. So many nice surprises. 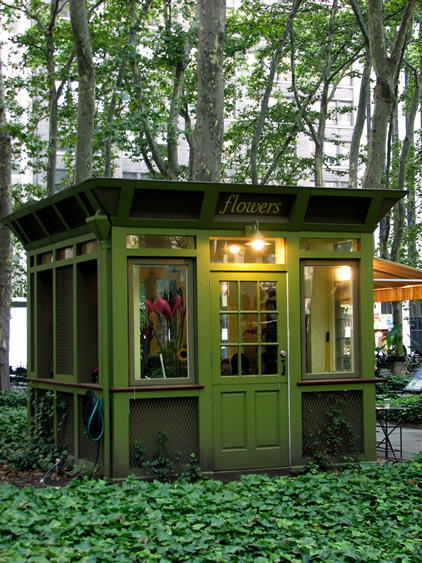 By the way, don't you just dream of owning a petite flower shop like this one? Design Star Tonight - Tuning In?